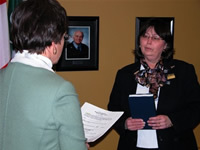 On Monday, December 4th, 2006, Madame Justice Patricia C. Hennessy administered the Oath of Office to Trustees elected or acclaimed to serve on Rainbow District School Board over the next four years. 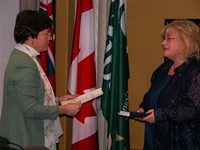 Following the swearing in ceremony, Trustee Dena Morrison was acclaimed Chair of the Board and Trustee Judy Hunda was acclaimed Vice-Chair of the Board. Membership on Board committees was also approved. Dena Morrison begins her fourth term as Chair of the Board. She has been a trustee since 1998. In 2003, she served as Vice-Chair of the Board. Raised in New Sudbury, Dena Morrison attended Col. David Younger Public School, Carl A. Nesbitt Public School and Lasalle Secondary School. She attended the University of Western Ontario. Trustee Morrison worked for the federal government for more than 20 years, gaining extensive experience in administration, policy development, human resource management, and budgeting. She held a number of positions of progressive responsibility at the local, provincial and national levels in Sudbury, Toronto and Ottawa/Hull. Morrison played a leadership role in community consultations to establish Northeastern Elementary School in Garson, which opened in September 2002. Trustee Morrison has also served on every Board committee as Chair or as a member over the past eight years. Judy Hunda begins her fourth term as Vice-Chair of the Board. Elected in 1997, she has represented residents of Area 6 in the City of Greater Sudbury since the creation of Rainbow District School Board. Trustee Hunda is a member of the Board’s Parent Involvement Committee and is a former School Council Chair. She is also the current Chair of the Board’s Special Education Advisory Committee. Trustee Hunda has been extensively involved in the educational community for almost 20 years locally and provincially. She is a past member of the Board of Directors of the Ontario Public School Boards’ Association (OPSBA). She has also been invited to be a member of a number of Ministry panels and round table discussions. She is a graduate of MacLeod Public School and Lockerby Composite School. A life long resident of the City of Greater Sudbury, Gord Santala has served as a Rainbow District School Board trustee for 12 years. Trustee Santala is a passionate supporter of community based schooling. As an employment counselor with the Sudbury Vocational Resource Centre, he helps clients with career planning and job search skills. He is keenly aware of the link between education and career success, and is committed to providing learning environments where all children can succeed. Born and raised in Sudbury, Tyler Campbell is a Lo-Ellen Park Secondary School graduate. He has an Honours Bachelor of Commerce in Sports Administration degree from Laurentian University. Trustee Campbell was elected to the Board in 2003 and acclaimed in 2006. Over the years, he has been a member of several committees including the Negotiating Committee, the Technology Committee and the Accessibility Committee. Last fall, he was appointed to the Accessibility Standards Advisory Council of Ontario, which advises the Minister of Community and Social Services on accessibility for Ontarians with disabilities. Trustee Campbell is Manager of Corporate Services for ICAN – Independence Centre and Network, a community agency that supports people with physical disabilities to live independently. For the past few years, Ruth Ward has been Chair of the Board’s Parent Involvement Committee (formerly the School Council Co-ordinating Committee). In this capacity, she has participated in various workshops and made presentations on the important role of School Councils. She has been a member, chair and community representative on the School Council at Confederation Secondary School and Valley View Public School. While her children attended Val Caron Public School, she was a member of the Parent Teacher Association and was part of the Sudbury Board of Education’s Homework Committee. Trustee Ward has a Bachelor of Science in Psychology from the University of Toronto and has been self-employed as a bookkeeper for more than 20 years. She is currently a board member and treasurer of the Social Planning Council and of Chaplaincy Ministry in Long Term Care Facilities. Doreen Dewar is the longest serving trustee on the Board. She has served multiple terms as Chair and been a member of every Board committee. As Chair of the Board, she made many important presentations to Ministry Standing Committees. Following the creation of Rainbow District School Board, she helped review and revise the policies of the three amalgamated Boards. She has authored numerous newspaper articles and chaired many sub-committee meetings, including school review meetings. Doreen Dewar has been a teacher, homemaker, volunteer, coach and entrepreneur. She ran her own successful retail business for 11 years. She has received awards for community involvement both locally and provincially. 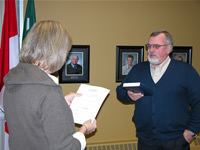 Larry Killens was a Trustee with Rainbow District School Board from 2000 to 2003, and, following one term, ran in the municipal election on Manitoulin Island. During his tenure with the Board, he was a member of many committees, including Finance. He also represented the Board at the Ontario Public School Boards’ Association (OPSBA). Trustee Killens retired from the Ontario Provincial Police in 1997 with 30 years of service. During his career, he received the Exemplary Service Medal and the Ontario Police Officer of the Year Award from the Ontario Chamber of Commerce. Active in the community, he has served as Chair of Manitoulin Mental Health. He is a past member of the Board of Directors of the Children’s Aid Society of Sudbury/Manitoulin and the South East Manitoulin Lions Club. He is also a charter member of Manitoulin VCARS. 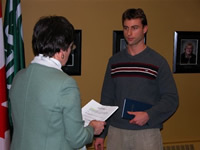 Trustee Killens is a Paralegal on Manitoulin Island. Jeanna Miller has been a trustee for the past 17 years with Rainbow District School Board and the former Espanola Board of Education. She has been a member of every standing committee of the Board. She has also served on a number of ad hoc committees. 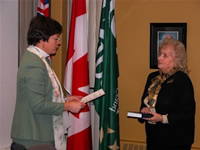 Prior to her retirement, Trustee Miller was the Corporate Secretary and Deputy Registrar for the Town of Espanola for 30 years. During that time, she served as Emergency Planning Co-ordinator and Clerk-Treasurer of the Township of Baldwin. 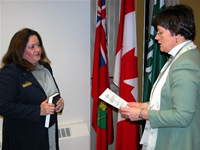 She has a wealth of experience on a variety of committees, volunteer associations and boards including the Espanola General Hospital Board, The Trillium Foundation of Ontario, Ontario Housing Corporation, Sudbury & District Health Council, Sudbury District West Health Advisory Committee, and the Espanola Housing Authority. Grace Fox represents the 11 First Nations communities who have educational service agreements with the Board. She joined the Board on October 17, 2005. 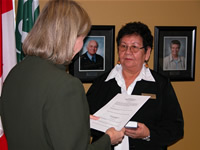 In August 2006, she was elected First Nations Director on the Ontario Public School Boards’ Association. Grace Fox is a band member of M’Chigeeng First Nation. She has a Master of Art in Education from Central Michigan University as well as a Bachelor of Education and Bachelor of Arts from Laurentian University. A member in good standing of the Ontario College of Teachers, Trustee Fox has Supervisory Officer Qualifications. Trustee Fox has worked as a Director of Education in Wikwemikong and Fort Hope. She has also been a Principal and Vice-Principal in M’Chigeeng, Fort Albany, Fort Hope and Christian Island. She has over 40 years of experience as a teacher and guidance counsellor in the provincial and federal school systems. She is one of the founding members of the Ojibwe Cultural Foundation and a former Chair of the West Bay Board of Education. 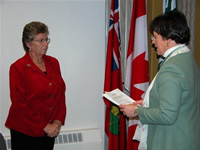 She has also served on the Board of the Manitoulin Health Centre and the Children’s Aid Society (Sudbury). Fluent in the Ojibway language, Trustee Fox has a history of organizing cultural learning activities in schools and has developed curriculum sanctioned by the Ministry of Education.